Our good friend Callum from 1Group comments on ‘off the plan’ purchases in today’s saturated market in his most recent blog. 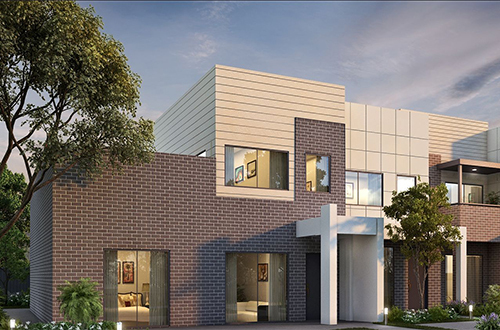 If you live in one of Australia’s capital cities, you’ll be familiar with the term off the plan it’s essentially signing a contract to purchase a property that’s yet to be built, it’s also bought at today’s prices and there are no holding costs until settlement. In theory, it sounds like a great strategy, something you buy now with minimal stamp duty (since you’ll only pay the land component) with the added benefit of it being brand new. A shiny new asset with high depreciation, beautiful with high-end brand name appliances and sleek fixtures and fittings. Usually located in suburbs you aspire to live in but perhaps can’t afford. On the flip side, it’s geared towards a developer’s best interest, that is, selling the asset at the highest possible profit. Purchasing off the plan in the currently plateauing market is a high risk and before we explain why, it’s important to understand the property market over the last few years and how we got to where we are. Melbourne and Sydney have seen a huge property boom in the last six years with prices soaring in these capital cities. Investor’s confidence has been high, and they’ve been aggressively taking advantage of negative gearing and the tax advantages that come with purchasing off the plan. Developers have the upper hand! In that type of heated market, the opportunity to negotiate with the developers has been minimal to non-existent because the demand was there, and purchasing was done with a sense of urgency and panic as no one wanted to ‘miss out’. When you purchase off the plan the contract moves to unconditional even before you know the quality, condition and timeframe for settlement. More importantly, you won’t know the end value and state of the market when the completion date arrives. Thus, you’re buying at today’s prices, but the property value can’t be realised until settlement, which could be years away! The ABS states that of the 227,122 dwellings under construction nationally, 69% are apartments. 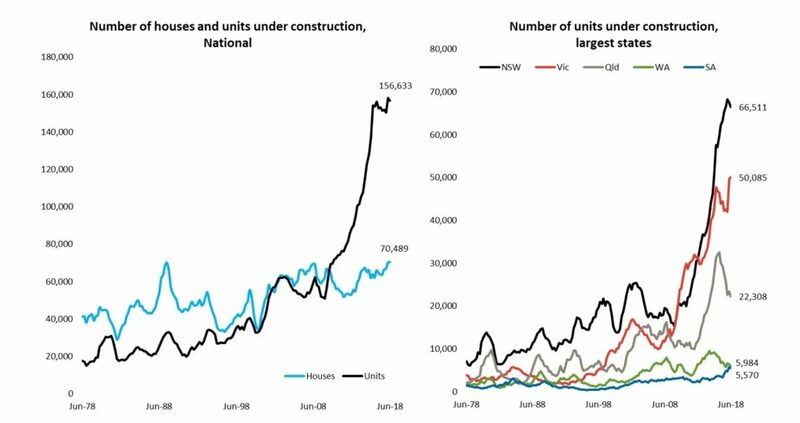 Before June 2008 house and unit construction was consistent but since then the increase is staggering (see left graph below). Whilst we agree that increased supply will help stem demand from population growth, especially given over 70% of our population lives in a capital city we don’t think it’s good for investment. Successful investment is about tapping into the supply versus demand equation and there is no scarcity in apartments as they’re everywhere. The property boom gave a false pretence to higher valued unit prices. In September this year Sydney found that 30% of off the plan unit valuations were lower than the contract price at the time of settlement, the previous year it was half that. In Melbourne, it wasn’t much better, with 28% of off the plan units receiving a valuation lower than the contract price. Brisbane was substantially higher at 48% combined with unit values down 10.5% since their June 2008 peak. Although unit construction peaked two years ago and much of the unit supply there is absorbed so the trend is easing. And despite supply tapering in NSW, VIC and QLD (see above graph on right) it’s still well ahead of the norm. Property investment shouldn’t be a quick win! Clients today are blaming the supposed market crash on low valuations and the property being worth less than what they paid for, but the reality is that even though the market is decreasing, they were paying too much at the time. Property investment is a strategy no matter what type of market you’re in and while a rampant market may wash away poor decisions with capital growth making anyone feel accomplished, that won’t be possible in the current climate. From our vantage point, the only market seeing growth with inner city apartments this past year is Sydney, where a one-bedroom apartment can be as high as $1 million (compared to Melbourne where you can buy the same for $400k). And yes, they do perform, if they didn’t they’d all be cheap, and we could own 20 of them. But the better question is, how do they perform against houses. If we look at the below data from CoreLogic it’s clear that houses (blue line) have less ‘loss making sales’ and that apartments are the more complex, risky asset class. We’re heading into a new phase of the property market, where prices are down -10-12% in Melbourne, with slightly higher falls in Sydney at around -10-15%, Brisbane is slowly rising a few percent, but only in the right areas. This creates great opportunity for buyers but highlights the importance of a well-researched plan and extensive due diligence. The style of property and suburb you choose is critical. Buying assets off the back of strong population growth and in the belief that they will perform eventually is not a sound strategy, as you can make choices that perform now, not years down the track. We recommend steering clear of off the plan. There may be an increase in ‘cheap’ opportunities as investors who can’t get finance after experiencing low valuations decide to sell off their bad decisions, but don’t be fooled. The market sets the property’s value, not the developer.